Throughout the 18th, 19th, and early 20th centuries beer was commonly bottled in stoneware bottles like that shown to the left. Stoneware bottles did provide the ultimate in protection from the detrimental effects of light though had other problems that eventually lessened their popularity, e.g., weight and closure limitations. The stoneware bottle pictured to the left was made in Great Britain during the 1870s or 1880s. Most stoneware bottles used in the U.S. were made in Great Britain and are commonly found on 19th century historic sites (Switzer 1974; Wilson 1981). 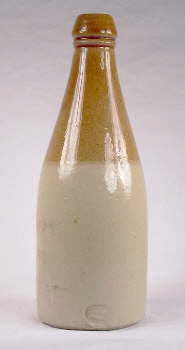 The pictured bottle had a fragmental label noting that it contained either ale or stout (i.e., "Ale/Stout"). Stoneware or ceramic bottles for beer were generally discontinued in the U. S. after about 1895 . The two main Victorian manufacturers of stoneware bottles were Doulton & Co and Joseph Bourne. The strength and durability of stoneware bottles made them ideal for both alcoholic and non alcoholic drinks and also for other liquids such as vinegar. Stoneware bottles had simple designs and were usually beige in colour but sometimes tan-coloured tops or brighter colours would be used and these are consequently of greater interest to a collector. Earlier bottles had the manufacturer's name and the contents etched onto them, but by the mid 1800's transfer printing or decorative underglazing was usually used for these identifications.